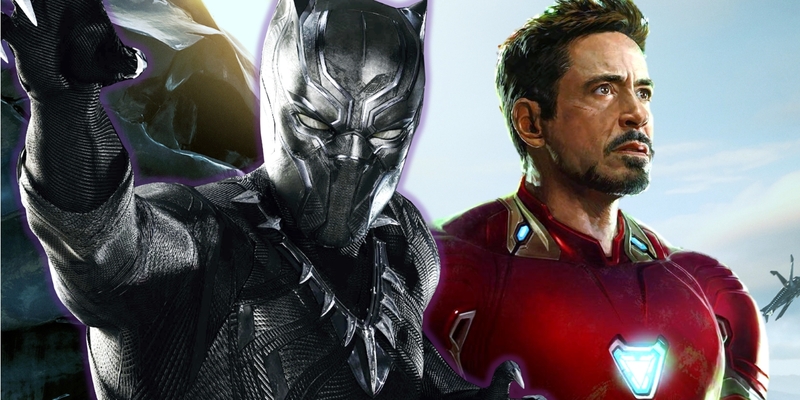 The Black Panther movie will reveal Wakanda to the MCU - along with the mystery of Iron Man's new Infinity War armor. It's possible that even devoted Marvel fans won't even have noticed that Iron Man is sporting a new armor for The Avengers: Infinity War, let alone that it would be a mystery if he were (Iron Man has more suits than sense). In this case, though, the version of armor Tony Stark has created seems to be beyond normal science or technology. And with Wakanda unlocking new forms of superhero costumes, it seems guaranteed that Black Panther paves the way for the future of Iron Man's armor. The first and best known Black Panther suit - or Black Panther Habit, as it's been designated - made its debut in Captain America: Civil War. While appearing as a thick fabric bodysuit contoured with heavier seems and accented with silver, its technology is far more advanced. For starters, the vibranium coveted by arms dealers the world over is woven into the suit, rendering it bulletproof without hindering movement. The same goes for the more visible vibranium accents, necklace, sharpened strike points, and razor-sharp claws. In Wakanda, holding the throne clearly has its privileges. It can also be assumed that the suit itself grants the wearer physical enhancements. Once T'Challa takes the role of king from his dead father (along with his ring), he also inherits the Black Panther Habit. using it almost immediately to hunt and kill his assassin. In the pursuit, the claws prove sharp enough to claw through vibranium, and the suit allows T'Challa to sprint and leap faster than a speeding vehicle. But T'Challa was also able to make a superhuman leap when attempting to save his father from the bombing. The best explanation, at least until otherwise explained, is that those of Wakanda's royal family are of enhanced abilities. With the Black Panther Habit, they become downright superhuman. Despite the need to keep the design simply and sleek, it was a memorable costume. But in his solo movie, the Black Panther is getting an upgrade. These days it's downright assumed that each new superhero movie will feature an updated, upgraded, or completely overhauled suit. Not only to sell new toys on the design, but the changing tastes of new directors, costumers, and visual effects teams. The trailer for Black Panther have confirmed that T'Challa's new upgraded suit will be worked into the plot of the movie, as shown in the above frame. The scene features Shuri (Letitia Wright) T'Challa's sister running down the changes she's made to the King of Wakanda's armor. As the country's top armorer and technophile, she's turned the near-mystical powers of vibranium into a suit of miracles. Beginning with the way in which the suit is actually deployed onto the wearer. In Civil War, the suit was literally a suit, composed of a bodysuit and a detachable helmet (it's visible in the above image, to the right of the new version). Yet all the footage of both Black Panther's hero and his villain depict the new suits essentially appearing on their bodies, spreading from an unknown source and shredding the clothes they're wearing into ribbons. The fact that even Erik Killmonger's Golden Jaguar Habit behaves the same way makes it more and less complicated to explain. Mainly because the only part of either man's costume that seems NOT to change is their large, spiked necklaces. So, has Shuri managed to contain and control vibranium from within a single piece of jewelry large enough to hold the living metal? It's more than plausible, and given how uncertain it is for the movie to adopt the explicitly magical source of Black Panther's power, probable. Explaining the suit's ability to conjure itself upon Black Panther's body through magic is easy. But advanced nanotechnology possible only in Wakanda is just as simple. And, judging by the footage we've seen of Iron Man's new armor and chestpiece in The Avengers: Infinity War, it's the kind of technology T'Challa can pass on to Tony Stark.